Last month, I finally had the chance to check Arches National Park in Moab, Utah off of my travel bucket list. It was an important trek out west since Arches has been at the very top of my list for quite a few years (even before the concept of a bucket list was popular). I had never been to Utah before so it’s difficult to articulate why Arches National Park has always spoken to me, but it has called to me since the first time I saw a photo from Arches. After the year I had last year, I made myself a promise that I would travel more. There were places I had always wanted to see so it was time to stop making excuses and just get there. 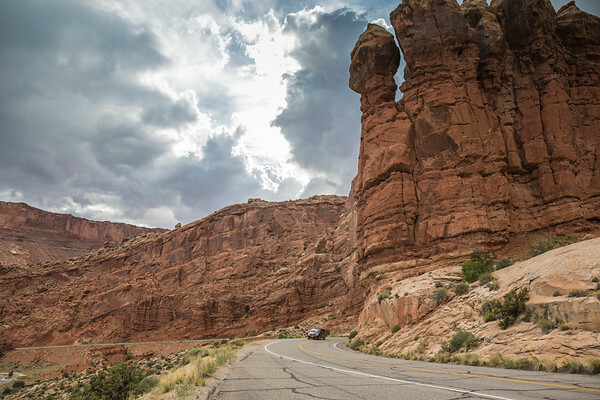 Arches isn’t the easiest place to get to – almost four hours by car from Salt Lake City or six hours by car from Denver. A storm delay made me miss my connecting flight to SLC. I was stuck on the plane after landing on the tarmac because we didn’t have a gate, and I watched my flight take off on the Southwest app as we waited. After an extra night at an airport hotel outside of Chicago, I was on a 6:00 a.m. flight to SLC one day later. The drive from SLC to Moab is absolutely beautiful. SLC is surrounded by the Wasatch mountain range that is visible the moment you leave the airport. The entire drive is just one beautiful desert scene after another. We headed straight to Arches since it was the late afternoon by the time we arrived in Moab. Arches Scenic Drive (photo below) lives up to its name. Yes, there are many famous arches and rock formations here, but the general scenery isn’t too shabby either. I particularly loved the backdrop of the La Sal Mountains as you start the scenic drive. Even in late May, there were still snow-capped mountains despite the temperatures in the 90s in the park. The first stop on our late afternoon drive was at Balanced Rock. 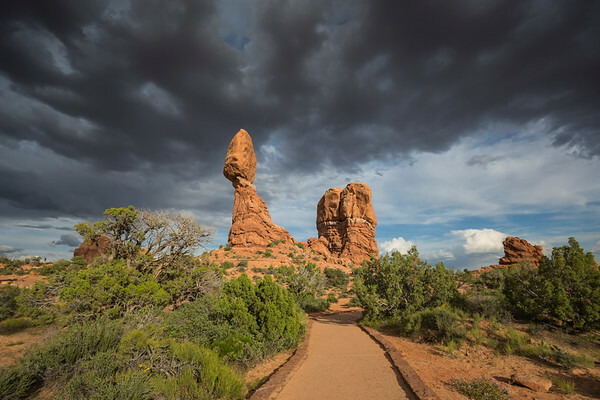 There were rain showers throughout the area and I was able to catch this dramatic shot (below) of Balanced Rock with storm clouds behind it. I was also able to catch a double rainbow over Balanced Rock after a shower came through. What a great welcome sign! 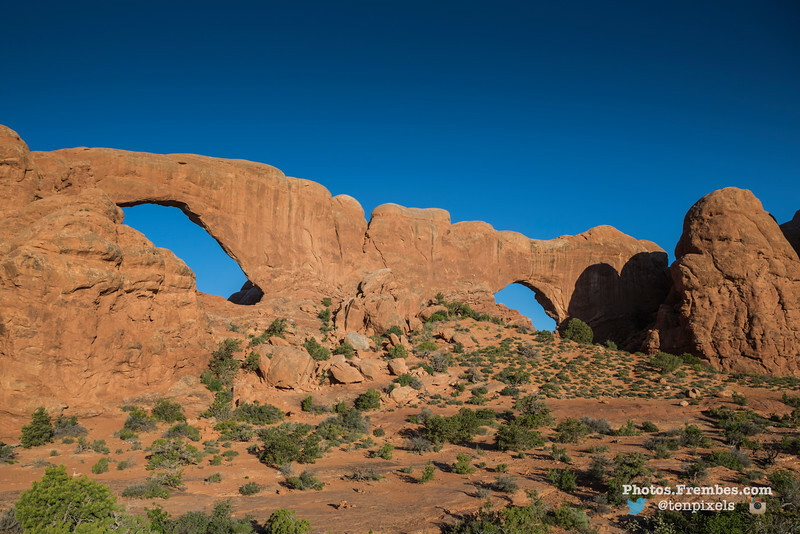 The second stop on our late afternoon drive was in The Windows section of Arches National Park where you can visit the North Window Arch, South Window Arch, and Turret Arch by walking one big loop. This stop produced one of my favorite shots of the entire trip (below). Notice the tiny people under North Window, a massively impressive arch! We returned the next morning at sunrise to walk the primitive loop trail around North and South Windows. You can see both arches lit by morning light from this trail. Fiery Furnace is one of three tough hikes I completed during the trip. Fiery Furnace is an area of Arches National Park that can only be accessed either with a special permit, or on a ranger-led hike. The area has no marked trails, no published map, and is so remote and cavernous that GPS and mobile signals aren’t consistent. 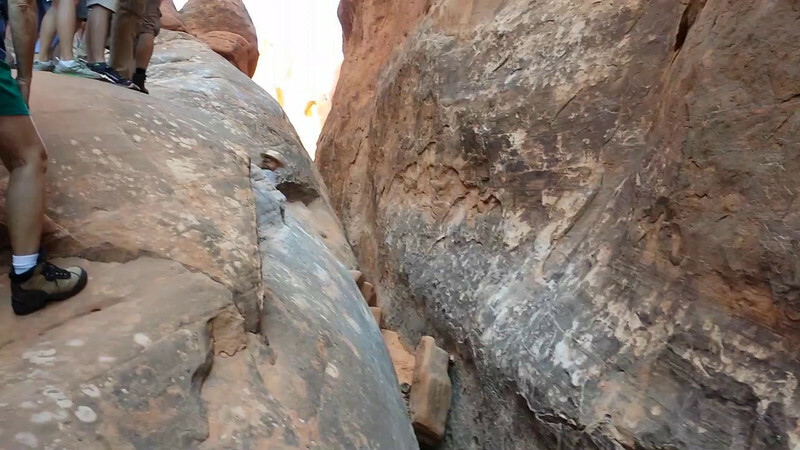 A novice hiker can easily get lost and get into big trouble in Fiery Furnace. Tickets for a ranger-led hike into Fiery Furnace are only $10 so reservations book up months in advance. I had only planned the Arches trip about a month before leaving, so I was sad to see the tickets weren’t available online. I checked every day like a proper neurotic person but to no avail. As luck would have it, we saw this sign (below) when we walked into the Visitors Center on our first full day in the park. There were cancellations and we were able to hop on the tour on short notice. Yippee! You can also check out the National Park Service video overview of the hike. 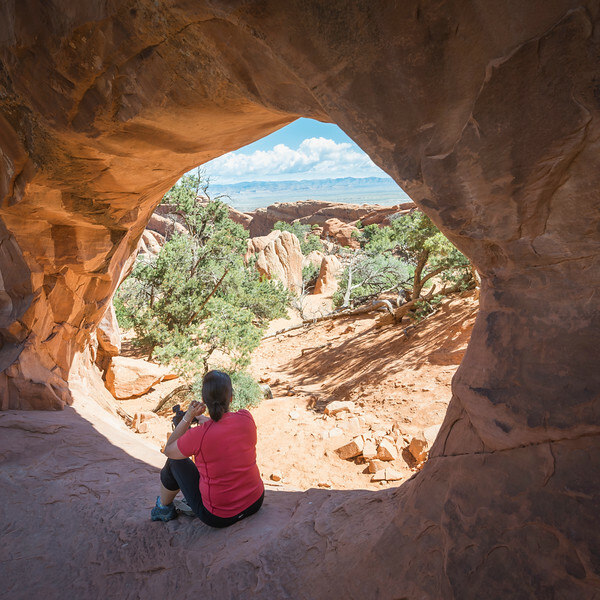 The Fiery Furnace hike is tough, yes, but there are also rewards. 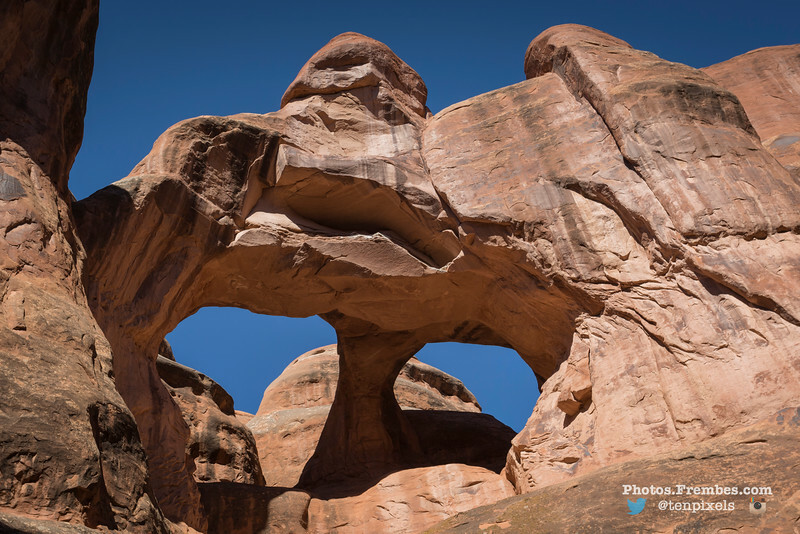 Twin Arch, also known as Skull Arch (below), can only be seen on foot in Fiery Furnace. Such a great view of a slightly creepy arch! The second tough hike of the trip was a 5-mile hike to Landscape Arch and Double O Arch in Devil’s Garden. 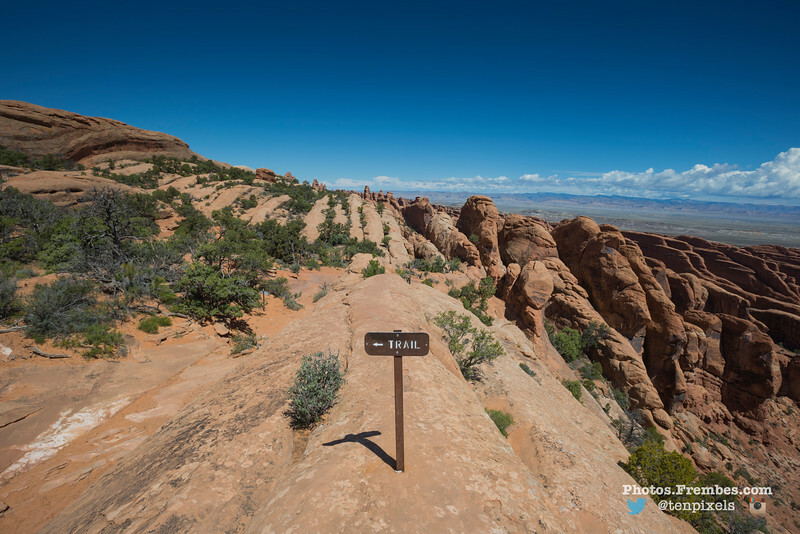 The hike to Landscape Arch is marked and is fairly easy. If you choose to go on, the rest of the trail is primitive and strenuous. 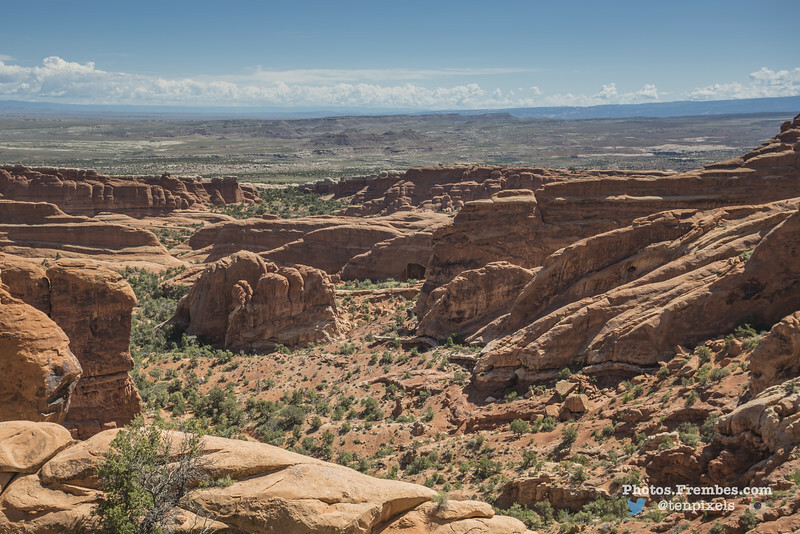 One of the spectacular views on the way to Double O Arch is the Black Arch Overlook. Unfortunately, there is no trail to Black Arch and no easy way to get there. 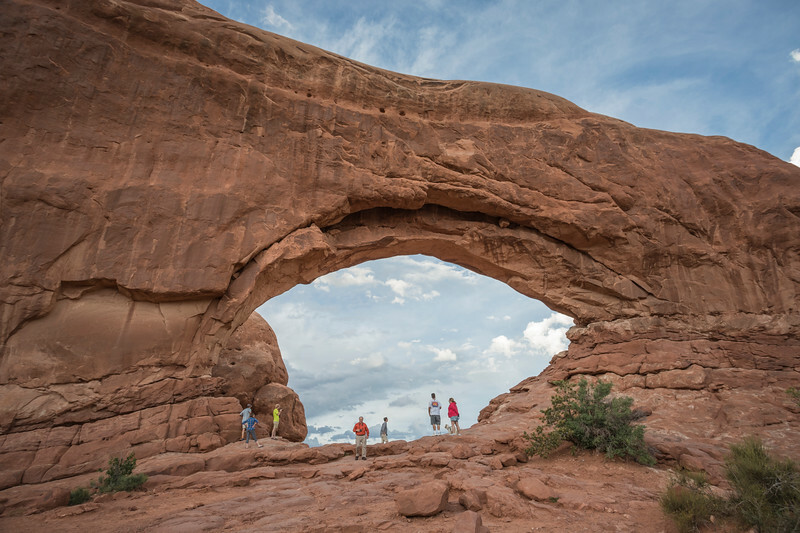 The approach to Double O Arch is scenic and includes a walk over a rock fin to get there. The arch itself provides a nice place to take a quick rest before heading back. The third tough hike of the trip was on the Tower Arch Trail. This trail and arch is in the northwest corner of Arches National Park and is set apart from most of the other popular arches. There is a drive on an unpaved road to get to the trailhead, as well as a turnoff that brings you to a 4×4 lot that’s closer to Tower Arch. We missed the turnoff to the 4×4 lot and ended up at the trailhead, where it’s a 1.5 mile hike versus a 0.5 mile hike. No matter. The 1.5 was beautiful, albeit there is one section where it’s uphill in ankle-deep sand with the afternoon sun beating on your back. The distance isn’t what made this hike tough, rather it was the climbing. There is a steep climb at the beginning and in the middle. Add in some desert heat, and it feels way longer than 1.5 miles. 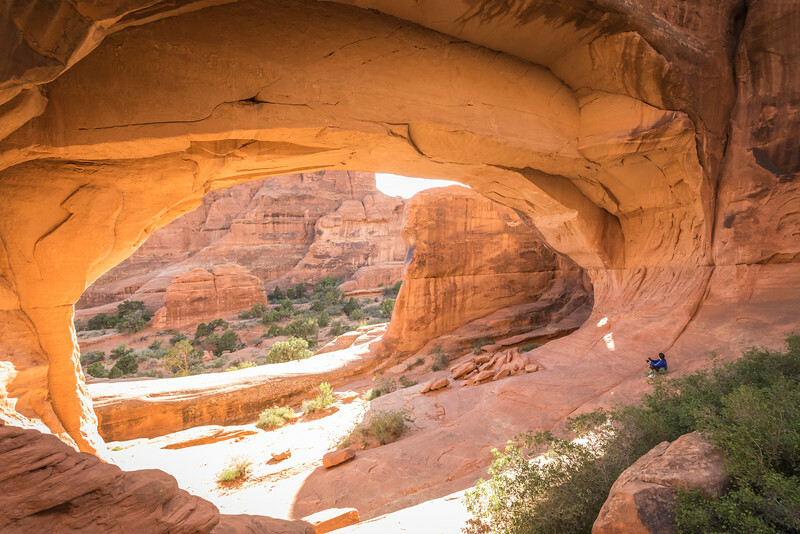 The payoff is a massive, amazing, awe-inspiring arch that you pretty much have to yourself to explore. You can see my complete photo album online at my photo site.